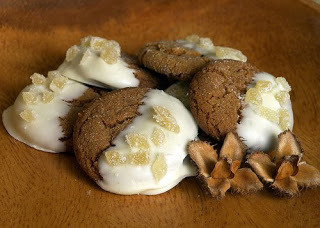 Day 4 of our 12 Days of Cookies presents our favorite Gingersnap cookie recipe. Enjoy! Place chips and shortening in microwavable bowl. Microwave uncovered, on medium-high heat for 1 1/2 – 2 minutes, stirring every 15 seconds, until smooth. Dip half of each cooled cookie into melted mixture; sprinkle tops with crystallized ginger. Place on waxed paper; let stand until coating is firm.Makes 4 dozen cookiesThis recipe, and 349 others can be found in our cookbook “Rocky Mountain Lodge & Cabins Favorite Recipes” which can be purchased in our Gift Shop. Click Here to order your copy.